49-Key controller in a limited edition all black keys model. 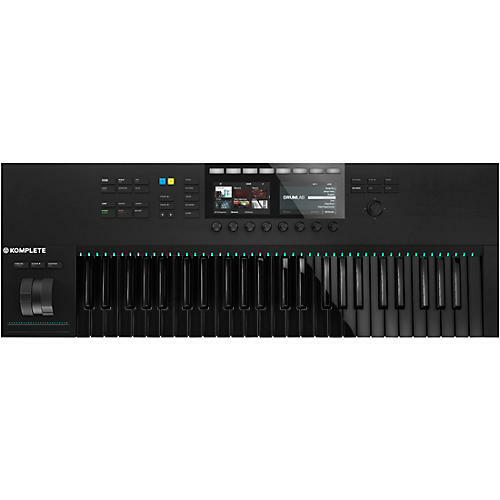 With KOMPLETE KONTROL, music-making becomes a more intuitive, hands-on experience. Perform expressively, browse and preview sounds, tweak parameters, sketch your ideas, then navigate and mix your project – all from one fully integrated centerpiece for studio and stage. Now with the MK2 version of the KOMPLETE KONTROL S-Series, you'll have even greater control over your music. New in version 2 are dual high-resolution color screens for browsing, tweaking, mixing and more. The KOMPLETE KONTROL S-Series has also received a refreshing update to its knobs and controls, adding a more ergonomic look and feel, as well as a 4-directional push encoder for one-handed sound browsing and project navigation. You get the same deep integration with MASCHINE software and hardware, as well as pre-mapped control of KOMPLETE instruments and hundreds of Native Kontrol Standard (NKS) instruments from leading manufacturers.